This review assumes a basic understanding of smartphone terminology. Reviewed March 2013 + updates below. Note: although this article refers to the particular smartphone we bought, the Samsung Galaxy W i1850, much of the stuff we discuss in this review is common to the Samsung Galaxy range and indeed similar to other smartphone brands running Android. Well, deciding on a new smartphone to fit our requirements was actually pretty straightforward. Right at the outset we decided against going down the iPhone path for no other reason than cost and the hype, looked at Windows and Blackberry, then came down in favour of Android (and Belinda thought the Android icon well cute!). Android is well established, less costly than a comparable iPhone, a large range of apps are available, and, with plenty of handset choice, we just had to decide which one! Cue some internet research and we determined that a smartphone from the Samsung Galaxy range would fit the bill nicely. Now we required our smartphone unlocked and SIM free, light and easily held in the hand for lengthy periods (you'll see why later), a clear display, not too costly; and we didn't require the ultimate in terms of speed, memory or performance. So we went for an older mid-range smartphone - the Samsung Galaxy W i1850 - yes we know, so-last-year (in 2012), but its price from a very well known online retailer reflected this. Now Mike's a gadget fiend and all the usual smartphone features are present and correct on the Samsung Galaxy W such as 3G, Wi-Fi, Bluetooth, GPS; and stock (pre-installed) applications like a web browser, email, social media hub, camera, FM radio, music player, mapping, calender, memo, office functionally... you get the drift. And of course it can be expanded by installing applications (apps) from the Google Play store (for which we've created a dedicated Android apps page). Right. The Samsung Galaxy W i1850 showing our idle screen. (Mike's now deleted that wicked app that uninstalled his arm!). The Samsung Galaxy W smartphone runs the by now aged(!) Gingerbread 2.3.6 version of Android, has 351MB of usable RAM, a total of 2.7GB internal storage, and a 3.7 inch 800 x 480px resolution touch screen. Memory is expandable up to 32GB with a microSD memory card. Ah yes, those vital extras. For our Samsung smartphone we bought a protective case, screen protectors, several additional batteries, microSD card, car windscreen suction mount and curly charger lead. Oh, and some decent earphones. Originally we got a flip type case to house the smartphone, but quickly found the 'flip' bit a flipping flapping pain when open so ditched this in favour of a rubberised 'grippy' type surround offering more protection from those inevitable knocks and drops (judging by the number of people who drop their phone in the street!). The screen protector peels onto the screen to protect from scratches, although this is easier said than done - those pesky air bubbles are a real faff to eliminate! We got a 16GB microSD card (mounts internally near the SIM) to store all our files - photos and videos taken with the smartphone, plus our extensive MP3 music collection. 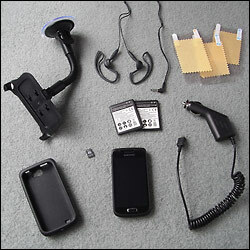 And for in-car Sat Nav use we got a smartphone windscreen mount and lighter plug charger lead. This bit's intended for those less familiar with mobile devices, established smartphone users please skip! Well this was pretty much a doddle. First thing was to download the Samsung Galaxy W user guide from the Samsung website. Next, after inserting our SIM card, microSD and battery, we left it to charge for a few hours. When fired up a welcome screen walked us through setting stuff like language and date & time. The phone recognised our mobile network, and, with the basics done, we delved into the smartphone's settings menu and set ring and message tones, a security screen-lock pattern, other security and privacy settings, display time-outs, and power save options. Next we connected to our Wi-Fi network and tried the phone's web browser and email (after inputting our email account details) and checked out a few of the stock apps such as News & Weather, Google Maps and YouTube (more later). Then we tried dragging a few app icons and widgets onto the idle screen and generally finding our way around the smartphone. We tested the Bluetooth by transferring files between another Bluetooth-enabled mobile device. As navigation was intended as a major use for our smartphone we familiarised ourselves with the GPS settings; GPS sensor, wireless networks and AGPS. Finally, we made the required settings in the various apps that create files, such as the camera, to direct these to the microSD card so as not to chomp into the smartphone's limited internal memory. Oh, might as well mention it here, the phone's Task Manager is used to access recent applications, clear running apps, uninstall downloaded apps, free up RAM and check storage status. There's two ways to do this, either with the supplied USB cable or by using the Samsung Kies utility (more later). Now you'd think simply connecting the USB cable and the phone would come up on the computer as another drive, but oh no; first you have to dip into the USB utilities and follow the procedure before it connects. Then not one but two drives appear on the PC's screen; the phone's own memory and the microSD card. OK, once sussed it's no big deal and copying files either way is then done in the usual way. Initially we created a few folders on the microSD, such as 'music' and 'documents' and copied a selection of MP3 music files, Word, Excel and PDF docs to try out. So, how was the Samsung Galaxy W in use? Our first major outing with the smartphone was on our June 2012 Wiltshire holiday. Sometimes the phone forgets display settings - brightness and screen time-out - following a recharge. We like it on 2 minutes and it commonly resets itself to 1 minute, and once to 10 minutes. The brightness setting has to be near max outdoors in bright sunshine, while near min indoors. Fortunately there's no need to delve into the settings menu as it's quickly altered by swiping the top status bar. Our tip: turn it up BEFORE going outdoors as once outside the dimmed touch screen is difficult to see to ramp it up! Screenshot of our smartphone's home screen (tip: press the home and power keys together to capture a screenshot). We definitely needed the extra batteries as predictably the smartphone endures a higher drain whenever the screen is on. Some apps keep the screen up by necessity, such as navigational apps, so the car charger and extra batteries proved invaluable. Our worst case scenario is when geocaching; the screen's on continually, brightness pretty much maxed out, GPS on, several apps running simultaneously... this situation results in perhaps only three hours use from a battery and we can drain three batteries in a day. And the smartphone isn't really designed for regular battery change, although we became quite expert at quickly popping the back off in less than ideal conditions. Conversely, in less arduous use a battery can last for many days. Our tip: save power by deactivating features like GPS, Wi-Fi, unneeded apps, when not required and lower the touch screen brightness. On a number of occasions we experienced what seemed like random reboots, mainly during use as a car Sat Nav, with the phone in its windscreen suction mount arm. Now you really don't want the smartphone to fail like this while driving, as it means having to pull in and reset stuff. It happened to us twice during our Wiltshire touring driving an unfamiliar area and was most inconvenient. It also happened a few more times, and following a fail in use as a music player while walking we investigated further. Realising it had only failed at times the phone was subject to vibration we figured a likely cause as the battery monumentally losing connection with its contacts. A quick clean and 'persuasion' of a more positive contact and it's been fine since. Job done. 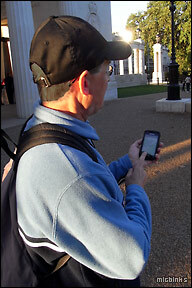 Mike using the Samsung Galaxy smartphone out and about in London (now complete with reinstalled arm). On the Samsung Galaxy the keyboard can be configured to a preferred style which includes standard qwerty, swype and with predictive text. And auto functions can be enabled such as spacing, capitalisation, full-stop. Then there's voice recognition; by heck we've had some fun with this to see what odd words it construes! Samsung Kies - smartphone software that wasn't so smart! Samsung Kies is Samsung's own utility to interface and sync the Galaxy smartphone to your main computer. We downloaded and installed the Kies software (a whopping 80MB), following which it immediately decided it needed updating! Kies added no less than three items to our PC's Windows start-up and running processes - we later removed these to preserve resources as they kick-in when launching Kies anyway. So with all updates completed and Kies now running fine we next used it to back-up the phone's data which it did just fine. Then we tried editing our contacts and backing this up in Kies, again it worked well and looks handy to manage the phone contacts on the PC rather than the smartphone itself. But just as our faith in Kies was restored we soon landed with a thud when we found the date/time of photo and video files transferred by Kies was modified to the current date. This is a big no-no for us as we rely on sorting our media by date. And there's more bad news - clicking the Kies folder columns to sort, eg. the 'date' column, it refused to stay sorted, and neither did photos display in order when viewed! And more still - deleting a transferred-to-PC file through Kies didn't actually delete the file. What a carry-on! So we ditched Kies for the smartphone interface and stuck with direct USB, to retain full control and ensure files aren't modified. This rather limits the usefulness of Kies which seems clunky and ill thought out. Maybe a future software update will resolve these issues (see our smartphone review updates below). On the Galaxy smartphone itself the Kies Air app is used to allow connection to other mobile devices and PC via Wi-Fi, but we've wimped out of trying this yet given the issues we encountered. The Samsung Galaxy W smartphone comes with many stock apps pre-installed and here we'll take a quick look at our experiences, together with our handy tips. The standard Android web browser is fine for general viewing. Oft used sites can be bookmarked, sites can be opened in new windows, there's a page search and a multitude of settings to control things such as privacy, pop-ups, page fit, image display and cookies. Strangely, the browser has its own brightness setting. Another strange thing, after exiting it tends to be left running in Task Manager. The email client is less intuitive, we found inbox messages were not stored if later downloaded from the mail server, it didn't seem to want to store drafts to send later, and when composing an email we found it difficult to select an insertion point cursor at the required position as it tends to jump to a downward pointing arrow which is then then hidden by your finger. Our tip: there's plenty of other email and browser apps available on Google Play. Right. Some of the stock apps on the Samsung Galaxy W smartphone. Any smartphone camera is going to be limited by both its small lens and image sensor size (5 megapixels on the Galaxy W) so we weren't expecting too much. There's all the usual settings - resolution (but no JPEG compression control, eg. normal, fine); flash firing, scene mode, white balance, self-timer, metering, etc. and up to four oft used ones can be added to the camera screen. Photos can be geotagged but we found this to be very inaccurate (~300metres) when checking images on Google Earth. Switching between photo and video mode is conveniently done via a slider icon, and video can be captured up to 1280x720 pixels. Subjectively, photos looked reasonable but image noise and a lack of fine detail soon became apparent when viewing on the PC's larger screen. Videos faired a bit better with well saturated colours, but the audio sounded harsh and stereo ill-defined. File sizes indicate a minimal compression/bit rate (a good thing). As a handy camera it's perfectly fine, but much better results are had with a dedicated compact camera. There is a photo editor but we'll continue image editing on our carefully calibrated computer thank you very much. Media can be found in the phone's Gallery which can be organised in various ways. Our tip: find the setting to store your media files on the microSD card or you'll soon consume the limited camera memory! 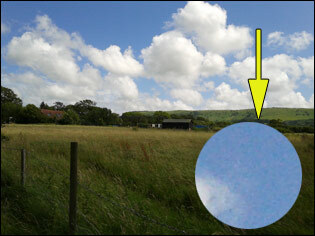 Image noise in the blue sky demonstrated by this overlaid sample at the original full resolution. The Samsung Galaxy W smartphone comes with a music player and FM radio. We copied many of our favourite MP3 files into a folder we named 'Music' on the microSD card and it found and played them just fine, even displaying the track meta-data and album images. Playlists can be created and searched, and various equaliser and effects added. The supplied in-ear headphones sounded fine (but no Beats Audio on this smartphone), but our existing on-head 'phones sounded rather bright (were fine on our old MP3 player). No amount of fiddling with the equaliser would solve this so we bought some supposedly high-quality hook-on-ear 'phones which also failed to sound good. A strange one this... The FM radio can scan and store stations (and loose them too! ), display the station ID and find alternative frequencies. The headphones wire acts as an aerial; as this inevitably swings around reception can vary. Our tip: the music player can run in the background sucking up battery and often remained launched after closing, so exit it using Task Manager. There's also a basic voice recorder which captures sounds in the vicinity quite well. We like this one, setting a location delivers the local weather forecast for the next 24 hours in a handy chart and a quick forecast for the week ahead. It can also find your current location from the GPS or mobile network for localised reports. The news part has several pre-set topics and custom ones of your own can be added. Our tip: expect a set weather location to bounce among nearby different towns each time you launch this app! The smartphone came with Polaris Office which allows Word, Excel and PowerPoint type files to be viewed and created and PDF files to be read. There's also the usual calender, memo, task, mini diary and calculator and all work as expected. All the phone's files can be found in File Viewer and a base folder can be specified (we set this to the ext. microSD card) and system folders can be hidden. Our tip: install the more intuitive Adobe Reader app for viewing PDF files. Right. Warm sunshine all the way today, the graph shows temperature over time of day. Really a mobile version of the main YouTube with options for sizing, video quality, preloading videos and search filtering. Strangely, the option for localising search doesn't consult the GPS and it's not possible to bookmark oft used channels. While it works well enough, the small screen size and tiny speaker means higher quality videos loose impact, although there's a function to pair with a (suitable) TV. Videos can also be uploaded after signing in with a Google account. Our tip: handy for a quick look, but we much prefer a larger screen for video. What can we say about the online bible of mapping? It does most of what you'd expect, with various zoomable map view layers (street, satellite, terrain... etc) and caches them for offline use, although this is time limited. Distances can be measured and of course it uses the phone's GPS (or mobile network) to show your current location. Nearby places can be searched for, saved and navigated to with spoken directions and you can set your own start and end point, get directions and navigate the route. Street view is included and interfaces with Google Latitude for finding where friends are located, or share your location. But we found all was not well when using Google Navigation; it annoyingly persisted in reading out a URL, often tried to direct us the wrong way round roundabouts, and, unless the mobile data network is used or the whole route map cached in advance, the map runs out! However, with a bit of pre-map caching we found having Google Maps with us a godsend when out foot-powered and with periodic data connection via Wi-Fi hotspots finding local amenities was a doddle using Google Local. 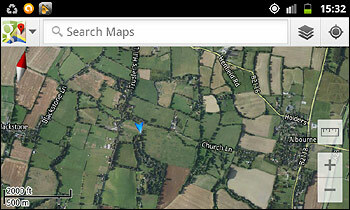 Our tip: for Sat Nav use ditch it in favour of a dedicated Sat Nav app with offline map support (see our app reviews). Google Maps smartphone app with blue arrow showing our GPS location and direction of travel on a previously cached satellite view. Well that little lot above covers the Samsung Galaxy W smartphone's main stock apps we've tried, there's others pre-installed such as Social Hub, Games Hub and AllShare we've not tried, mainly because we found other ones on Google Play that do the job better. Our tip: always check for alternative apps that may do the job better! Samsung Galaxy smartphones run on Google's Android operating system and therefore the world of apps (and there's now oodles of them for Android) is available. Apps customise and extend the functionally of the phone, much like browser extensions or programs do on the PC or Mac. A year has passed since we reviewed our Samsung Galaxy W i1850 smartphone; back then we'd already owned it for almost a year and even then it was an older model. So, how has it faired since? Oo-er, we have to say Gingerbread 2.3.6 is, like, well dated now! But the phone continues to work just fine, at least most of the time. We've not (yet) encountered any issue with apps only working on later versions of Android, or existing apps throwing a wobbly after updating that can be put down incompatibility with the operating system. We do find the Galaxy W's puny system memory (351MB RAM!) a limiting factor and have learnt not to run more than a few heavy-on-resources apps simultaneously, ie. those using mapping and GPS. And we overcame the smartphone's non-maintained settings of screen brightness, timeout and date/time on battery change by perfecting a lightning fast battery swap technique! As you would expect, over time our original screen protector became marked, mainly by vertical swipe marks. So we've changed it but it doesn't get any easier to do without those bothersome air bubbles frustrating fitment; we again ruined one protector before getting the blighter on neatly. Otherwise, the phone's appearance is holding up well, as is the grippy rubbery surround we fitted to protect from those inevitable drops and knocks. On one occasion when booting up the smartphone, the external microSD card showed as empty which caused panic, however, after removing and reinserting all was well. We've experienced random screen brightness changes; not so bad when it goes brighter indoors but when it's gone darker outside or in the car (in use as a satnav) it's more of a faff as the now dark screen means it's difficult to see to adjust back up! You'll know from our original review we were none too impressed with Samsung's PC interface, Kies. Well, despite numerous updates it still fails to impress! So we've stuck with connecting the smartphone to PC using the USB cable connection mode to transfer files either way. We've used Kies to update the phone's firmware again and were prepared for the hanging 'Samsung' boot screen this time, although said update, like before, again seemed to not do much, probably some under-the-hood changes like security fixes. We've been boringly unadventurous with trying alternative apps to the standard Android ones for email and internet as we find the small screen non-intuitive. Of course it's useful for checking stuff when out and about, where these stock apps are perfectly functional in this capacity, but it doesn't replace our larger screen devices. The same applies for the camera apps for stills and video - they work well enough for casual use but they don't replace our digital camera or camcorder on holidays or outings. We found a flaw with the geotagging of photos on our Samsung Galaxy, not only is it way too inaccurate as reported in our main review, but the 'on' GPS tag setting is forgotten after disabling the GPS on the phone meaning we have to remember to set this each time - what a carry-on! While on the subject of GPS, we've found the cold start Time to First Fix (TTFF) to sometimes be excessive - far longer than the up-to 12 minutes specified (under stationary, clear sky view conditions). A similar Samsung smartphone (Galaxy Ace 2) used alongside doesn't take nearly so long (perhaps because it has GLONASS capability). We've tried resetting the GPS chip and downloading fresh A-GPS data (via the GPS Status app) but this doesn't effect a fix. However, we devised a crude work-a-round involving closing and reopening a variety of our apps that use GPS and this seems to trigger a fix so maybe the problem's not the smartphone's GPS sensor but app related. Anyway, we'll let you know in our next update if we've overcome this strange one on our Galaxy W! Also check our Android Apps page, we update our apps reviews here too. Oh, one more of the stock pre-installed apps has acted strangely on our Samsung Galaxy and that's the News & Weather app. Despite setting it to our nearest town it still picks nearby towns at random for the weather and it inexplicably decides to stop displaying pages for some of our custom news topics we set. Deleting and re-entering these solves it for a while, but then it goes again. Perhaps our Galaxy smartphone's low system resource RAM is the cause of many of these minor-but-still-frustrating issues. Or perhaps the now ancient Android Gingerbread 2.3.6. But we expect we'll still be using this Samsung smartphone in another year's time so please check back for another review update then! Well here we are still using this now somewhat dated Samsung Galaxy W i1850 smartphone. Firstly, let's recap on some of the issues we highlighted with our phone last update, starting with the apps. We're pleased to report that the stock News & Weather app hasn't 'lost' our set custom news topics since, although it still changes its mind (it must be female!) as to our set weather location. In the last year this app has a new version release but this isn't compatible with our phone's ancient Gingerbread 2.3.6, a situation we're increasingly finding with other apps too, including our Sat Nav app Navfree (now called Navmii) which we're unable to update to. Talking of GPS related apps, we had a problem with the phone failing to establish a GPS fix one day following a battery change when out Geocaching. Nothing we tried could fix it and it was only when looking again next day we realised the date/time was wrong... well, the time and day were correct but the date was out by a week or two. Now this changing on battery swap is something we're well aware of but clearly failed to notice at the time as the reset day and time bizarrely happened to coincide. Clearly for GPS to get a fix there's a device/satellites date/time comparison. And what of the lengthy cold start Time to First Fix problem we mentioned last update? Well, this seems a lot better now, even fixing within a minute sometimes. Perhaps there were things going on with the GPS system at the time. Tech, eh! There's only one more issue we've encountered and that's with the USB connection. On occasions it's failed to connect to either our PC or laptop, or it disconnects in use. And it isn't a faulty cable (the primary suspect) or dodgy plug/socket, proved by wiggling them at a time it connected well. It doesn't happen very often, but it's certainly frustrating when it does. Oh well, we'll put it down to another quirk of the phone. With the Samsung Galaxy W i1850 smartphone now very much an older model after just a few years it's probably time to consider a replacement... Watch this space. Although this Samsung Galaxy W i1850 smartphone really is l-o-n-g in the tooth now it still works reasonably well. The positively pre-historic Android Gingerbread 2.3.6 operating system hasn't received any version updates since new - no lollipop here, or even KitKat! This means many of our installed apps can no longer get the latest updates, although they all still function just fine even if they inform an update is available then report it's not compatible with the phone when attempting to install it. Arrggh! In the last year the only issue we've encountered is the 'home' button has stopped working. This happened after it got a bit wet in a random rain shower (opps!). We goggled the issue and tried a fix with drops of an alcohol based cleaning solution around the button (it's a physical button rather than a software one) but this effected only a temporary fix. Now as you may know the home button is used to return to the home screen without closing open apps so it's quite useful. So after seeking out a work-a-round we installed a virtual home button app that's puts it on the status bar pull-down screen - not ideal but at least it restored some usability to the smartphone. It would seem non-functioning home buttons on older smartphones are quite common, even without the rain's help, so this may be worth keeping in mind. Well, after four years of ownership we feel we've run the course now with this Android mobile device and will probably not do any further updates for our Samsung Galaxy W i1850. It's proved a great little phone but undoubtedly we'll be replacing it in due course, certainly one with a bigger screen. The main reason we haven't yet is that many current devices don't have replaceable batteries and we need that ability for our geocaching use as we can easily get through four batteries in a day. So we'll be looking at large battery capacity/solar charging/external power... maybe... perhaps. But right now it's time once again to replace the device's screen protector, not a job we relish... Oh those pesky air bubbles! Digital Unite - Beginners guide to smartphones. 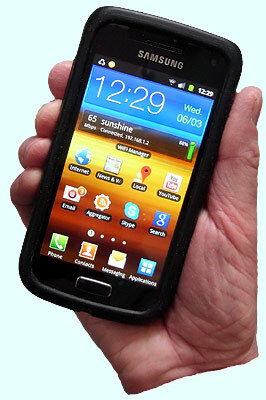 Know your mobile - News and reviews of smartphones and apps. Digital Spy - Discussion forum for mobile device users. Please inform us if you find deadlinks above. © micbinks 2013-2016. Please ask permission if you wish to reproduce any of our content.